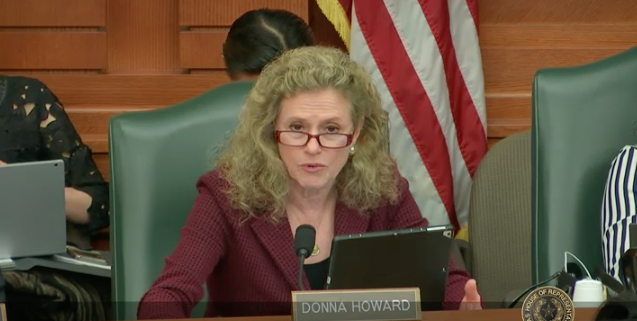 State Rep. Donna Howard of Austin questions Education Commissioner Mike Morath Monday in a House Appropriations Committee meeting. The pace is starting to pick up at the Capitol this week, with a flurry of activity related to public education scheduled. Today the House Appropriations Committee heard testimony from Texas Education Agency and Teacher Retirement System of Texas officials getting lawmakers up to speed on school security measures being implemented by districts, a primer on school finance and how are schools are funded, as well as an overview of pensions, and health care for both retired and active school employees. We’ll be covering more on school safety measure in upcoming Hotlines, but the status on pensions and health care may sound familiar. TRS last summer reduced its expected rate of return on investments—from 8 percent to 7.25 percent—which significantly raised the current funding period for the TRS pension plan to about 80 years. Texas statute requires that the funding period be less than 31 years before considering any benefit increases and remain under 31 years after providing any increases. Therefore the likelihood of any cost-of-living increase for retirees is zero unless the Legislature increases contributions to the plan. The total contribution increase would need to be at least 1.8 percent more on employee payroll to put the fund in a position for consideration of a cost-of-living increase. Bills have been introduced to increase contributions rates, so we’ll be monitoring them as the session progresses, but the real action for more state investment in the fund will be in the budget proceedings. The state’s contribution—now a very low 6.8 percent compared to other state educator retirement plans and to the 7.7 percent contributed by active school employees–must be raised significantly. TRS-Care continues to be funded by a pay-as-you-go system of lawmakers appropriating money each session to cover the costs. Both the House and Senate preliminary budgets contain funding to cover TRS-Care at its existing level of benefits and premium rates. You may recall that TRS-Care took a huge hit in reduced benefits and premium increases last session, so initial proposals would only retain the status quo after those changes. We’ll obviously be sending the message that this is unacceptable. Promises made to retirees for quality and affordable health care must be kept. TRS health plans for active employees will continue to face rising costs, and thus possible premium increases and benefit cuts. The state still has not increased its contribution to employee health care and is paying the same $75 per employee as it has since 2002. That 16 years of inaction by the state has left school employees—once paying about one-third of their coverage—now paying more than two thirds of their coverage. Bills have been introduced to increase the state contribution to health care, and we’ll highlight one of them that makes a lot of sense—HB 1219 by Rep. Roland Gutierrez (D-San Antonio). His bill requires TRS-ActiveCare to offer a plan comparable to the Employees Retirement System of Texas (ERS) Health Select plan for state employees. And it requires state contributions for active school employees be sufficient to pay the full cost of employee-only coverage when combined with the minimum required district contribution.